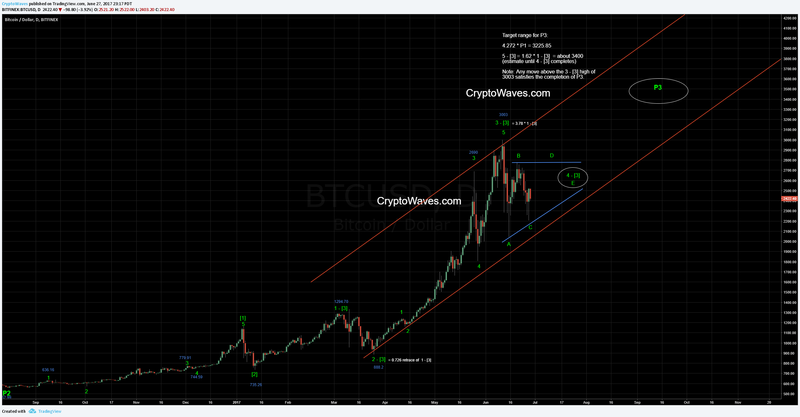 I currently have the count for Bitcoin in wave 4 –  – P3. The high at 3003 on Bitfinex marked the top for wave 3 –  – P3. Wave 3 did not disappoint, reaching a fib extension of 3.78 times the length of wave 1 – . This surpassed my expectations, as you can see from my previous post. At this time, I expect Bitcoin to form a flat-top ascending triangle consolidation. The triangle shape and price, shown with the blue lines in the daily chart, are an estimate. The drop for wave C-4- may be complete at 2207, or it can move lower a bit more towards the A-4- low at 2046. Wave C cannot move lower than wave A.
rather than matching B wave high. This triangle formation will allow Bitcoin price to consolidate before making its final wave 5 – . As you can see from the chart, the pattern can last a reasonable amount of time as price movement disappoints buyers who may be looking for a new high and sellers that are looking for new lows.